Alibaba Cloud Container Service blockchain solution is released in the Container Service Kubernetes app catalog in the form of Helm chart. You can follow these steps to view the blockchain solution information, such as the introduction and configuration parameters. Click Kubernetes > Store > App Catalog in the left-side navigation pane. Click ack-hyperledger-fabric on the App Catalog page. 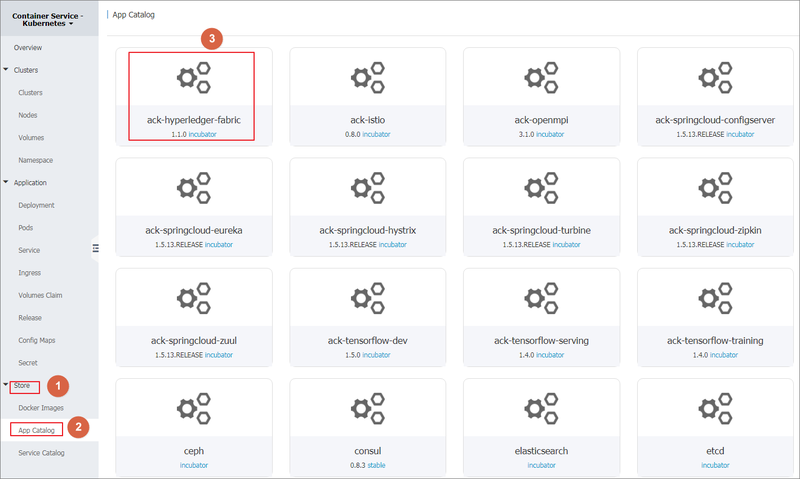 On the details page of ack-hyperledger-fabric, view the blockchain solution information, including the introduction, deployment conditions, deployment commands, test commands, debugging commands, and configuration parameters.